It’s been a little while since I read a novel with a First World War setting. Several popped up here earlier in the year but I think I’ve managed to avoid most of the deluge of books published on it recently. It was the Charles Rennie Mackintosh thread running through Mr Mac and Me rather than the war that attracted me to it. Impoverished and with nowhere else to go, Mackintosh and his artist wife Margaret spent the first year of the war on the Suffolk coast at Walberswick. Esther Freud tells their story from the point of view of Thomas Maggs the young son of a local publican with whom the Mackintoshs strike up a friendship. Thirteen-year-old Thomas is his parents’ only surviving son. His two sisters were born strong and healthy but his mother tends the graves of six other sons, leaving flowers daily. Once a sailor, his father is determined that Thomas will never go to sea. Thomas, of course, is fascinated by it and when war is declared he patrols the village coastline, eyes peeled for evidence of the enemy. Mackintosh and his wife have been living in the village for a while but when the Defence of the Realm Act comes into full force murmurs of suspicion are heard, becoming louder as news of casualties reach the village and sons come home less than they were. Mr Mac, as Thomas calls him, is an eccentric figure in a Suffolk on its guard against the enemy: striding out in his black cape, looking out to sea with his binoculars and speaking in that strange accent. It’s the old story – if you’re different, you’re probably up to no good, particularly in times of trouble. Even Thomas becomes alarmed when he comes across one of their art books with references in German. So enamoured with Mr Mac and his wife is he that he persuades himself it’s Gaelic, the language of Betty, the herring girl, with whom he is becoming sweetly besotted. Told in Thomas’s simple direct voice, Mr Mac and Me is studded with vivid, almost painterly vignettes of Suffolk life at the beginning of the war. The countryside is summoned up beautifully – Thomas walks amongst the sights, sounds and smells of a summer’s day hardly believing the carnage that is taking place just a short voyage away. The Mackintoshs’ art is lovingly described, their ability to surround themselves with beauty even amidst the dilapidation they find themselves in is vividly conveyed. Freud weaves their story seamlessly through Thomas’s with pleasing effect: entrusted with Mr Mac’s letters to Margaret when she is called home to help ease her sister’s disastrous marriage, Thomas lets his sister (and us) read them so that she can learn how to write a love letter. Thomas’s voice is captivating – he’s an endearing yet believable thirteen-year-old – and the story he tells is both absorbing and enlightening. Like many, I knew about Macintosh’s association with the Glasgow School of Art but little else and nothing, I’m ashamed to say about Margaret MacDonald Mackintosh’s work. I found it fascinating. It’s worth mentioning the book’s jacket which is lovely – an illustration ‘derived from Fritillaria’ a Mackintosh work from 1915 and one which he would have been working on at Walberswick. An altogether enjoyable novel then, but one whose title I found just a tad off-putting – not that it’s inaccurate but it doesn’t somehow feel right to me. What do you think? Do you have a reaction to book titles? Are they sometimes enough to put you off reading a book? 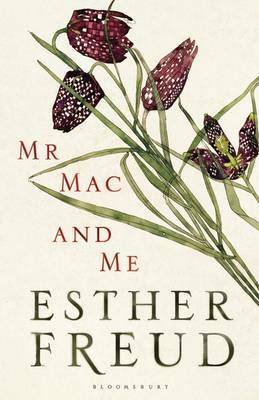 This entry was posted in Reviews and tagged Bloomsbury Books, British Fiction, Charles Rennie Macintosh, Esther Freud, Margaret Macdonald Mackintosh, Mr Mac and Me on 3 October 2014 by Susan Osborne. Thank you, Helen. She clearly loves this part of the world and writes about it beautifully. I do hope Bloomsbury keep that jacket for the paperback. It’s gorgeous. Great review, Susan, and the book’s themes sound really interesting. The R4 Saturday Review panel reviewed this a couple of weeks ago and gave it the thumbs up. At the end of their piece, the presenter mentioned that Esther Freud would be talking about the book on Sunday’s Open Book. I haven’t caught up with it yet, but it’ll be available as a podcast (if you missed it and are interested). Thanks you, Jacqui. I heard some of the Open Book interview and was surprised to hear that part of Freud’s inspiration had been a ghostly encounter! You’ll see what I mean when you listen to it. I thought this was beautifully written but it just didn’t grab me – I wanted to like it a lot more than I did. Ah well, wrong place, wrong time I expect. A friend of mine is fascinated by Mackintosh and created a whole dolls’ house in his style – I always want to play with it when I visit, never mind my 45 years! How funny – I wasn’t expecting to enjoy it but grew to love it the more I read! Your friend’s dolls’ house sounds lovely, a bit like the ones in Rijksmuseum perhaps? Yes, they are very like that! She’s been making them for years and has loads in a room set aside for them. I wouldn’t have the patience, or indeed the skills! I’m really not keen on the title either but plan to read it because I’ve read and enjoyed Esther Freud’s previous books and I like the whole CRM thing. And of course Walberswick! I can’t quite put my finger on why the title’s a problem for me but it doesn’t seem to fit the period, or indeed the tone of the book. It nearly put me off which would have been a great shame.